Bad weather prevented thousands of people attending PEGIDA’s ( Patriotic Europeans Against the Islamization of the West) celebration. Instead of the expected 5,000 crowd, the gathering in Theaterplatz drew around 2,800 people. Waving German flags and protest signs against refugees, Islam and German Chancellor Angela Merkel, the activists waited an hour for organizers to fix a technical glitch on stage before the rally officially got underway. German publisher, journalist and right-wing political activist, Gotz Kubitschek, addressed the crowd before welcoming the founder of the movement, Lutz Bachmann, who spoke on refugees and the Islamisation of Germany and wider Europe. Later, newly elected Bundestag deputies of the Alternative for Germany Party (AfD), who worked shoulder to shoulder with PEGIDA to score big in last month’s elections, addressed the crowd. “We, as the AfD, are of course – first and foremost – doing politics in the Saxony state parliament. But we’re there for the people nevertheless. We are there for the citizens. We are there for the people who have demonstrated every week for four years and it makes us happy to have a dialogue with them and to put our position to the people,” Sebastian Wippel, Political Spokesperson for Saxony AfD, told RT’s Ruptly. There was a heavy police presence of around 600 officers at the scene as the PEGIDA rally was confronted by a counter-demonstration which protested against the far-right party which entered the Bundestag for the first time since World War II. 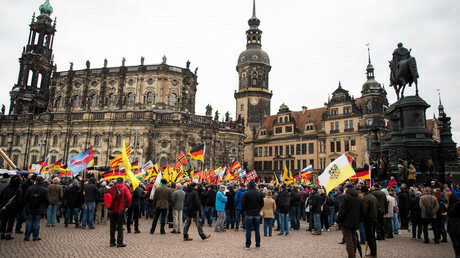 The leftist protest organized by the “Herz statt Hetzen” alliance under the motto “Dresden without racism,” was led by the city’s Mayor Dirk Hilbert, who represented the Free Democratic Party (FDP). The gathering was also attended by Martin Dulig of the Social Democratic Party of Germany (SDP), and who currently serves as Deputy Prime Minister of the Free State of Saxony. “It is important to point out where the red lines are, where inhibition is no longer tolerable,” Hilbert said at the event. Apart from the heated verbal exchanges between the rival camps, no major incidents were reported. Police did lead away four people, two from each camp, for minor infractions such as wearing a mask and an unauthorized Communist Party of Germany (KPD) print. PEGIDA has been exploiting the anti-immigrant agenda since its emergence in Dresden in late 2014. The movement has gained popularity in Germany and beyond, holding rallies against ‘Islamization,’ refugees and Angela Merkel’s so-called open-door migrant policy. The AfD won almost 13 percent of the vote in the September 24 national elections, making it the third-largest party in the Lower House of Parliament. Some members, though, have distanced themselves from the movement.